A residential area in the south-central province of Binh Dinh was still flooded as of the afternoon of December 17, 2016. A total of 111 people have lost their lives or gone missing after falling victim to repeated floods that struck the central part of Vietnam since October. The casualties were reported during a teleconference chaired by Prime Minister Nguyen Xuan Phuc on Saturday, which was aimed at discussing measures to cope with the consequences brought about by floods in central provinces. 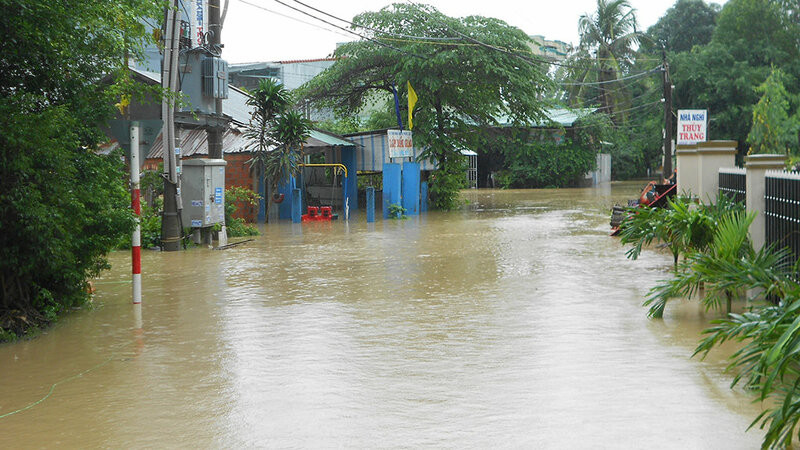 According to the Vietnamese head of government, as floodwater has subsided at a slow pace, the top priority must be given to rescuing and providing assistance for the affected residents, as well as preventing starvation, epidemics, and further damage. Local authorities were urged to exert maximum efforts to help people repair their houses and deal with other consequences. Deputy Prime Minister Trinh Dinh Dung attributed the exacerbation of flooding to the poor management of local reservoirs and hydroelectric projects. The deputy premier ordered relevant agencies to closely monitor the operation and safety of over 600 reservoirs in the central provinces and the Central Highlands. According to the Department of Natural Disaster Prevention and Control, torrential rains and floods that have ravaged the central region since mid-October have caused 111 people to die or go missing and injured some 121 others. A total of 316,720 houses were submerged and damaged while about 42,800 hectares of paddy and 39,200 hectares of crops were destroyed. Many farmers in the central provinces have lost spaces for agriculture and aquaculture to floodwaters, with total damage estimated at over VND8.5 trillion (US$37.4 million), the department stated. Large areas of flower gardens, which are to be decorations for the upcoming Lunar New Year holiday, have also been devastated by the inundation, causing immense losses for the owners. During the meeting, leaders of the affected localities called on the central government to provide support for flood victims to restore their daily life and production, requesting the emergency supply of 5,850 metric tons of rice and some five metric tons of dry food. Hoang Duc Cuong, director of the National Center for Hydro-meteorological Forecasting, warned of the coming of another wave of flood in the region between December 26 and 28, with rainfall expected to total about 300 millimeters. The bad weather condition is the result of a tropical depression forming in the East Vietnam Sea, combined with a cold front, Cuong elaborated.